ViparSpectra is a reliable and well known name in manufacturing and designing grow lights. This 600 Watts LED is a new Reflector Series grow light is great product to its indoor grow lights series. Its unique design brings the power of the sunlight and takes away the harmful effects. The Viparspectra Reflector is specially designed for all those plant growers who are looking for alternatives to grow plants indoors. It works perfectly to grow any sort of crops indoor. It has been tested by real customers with plants, flowers, and vegetables. Some users even report growing cannabis indoors with this product with excellent results. 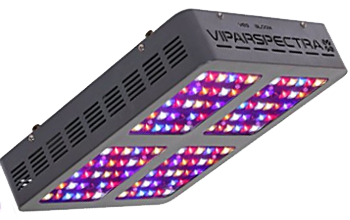 The ViparSpectra 600W LED adds power to your indoor growing. It is specially designed to give your plants the right light spectrum to help them grow better. The light source is a set of LEDs, which makes this unit more energy efficient than other LED lights. This light doesn’t release much heat, making it a perfect choice for indoor plants. 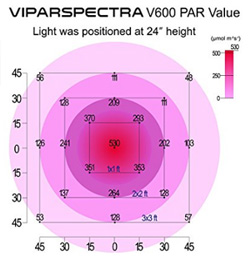 If you are looking for a more powerful LED read this review of ViparSpectra 1200W LED Light. The feedback from the customers is great, the reviews are taken from people who actually bought the light and used in their indoor room. Most of them are very happy with the results except few customers having some sort of complain, and most of them complain about a defective product, but that is too the customers who claimed warranty immediately received a replacement. Overall customers’ satisfaction is great. The ViparSpectra 600W LED grow light is an excellent replacement of a 600-Watt regular lamp. It brings the best of light to your indoor plants. The coverage is excellent and some users even re-port it is greater than specified. It also helps to save around 30% on the power bill. Everything you need is inside the box, so you don’t have to get additional items. Talking about the cons, the manufacturer ships some defective units. Some users were successful with their return claims, so make sure you get the perfect item before you install it in your grow room or grow tent. If you purchase this item we recommend you to test it immediately, so that you can claim any issue right away. Hanging this light is not an easy for a single person, so make sure you have your family member or a friend to help you hang this LED in your grow tent. 1. How does the hangers work? The ViparSpectra 600W LED Reflector comes with 4 hangers, one to be placed at each corner of this equipment. The hangers are sturdy and can carry the reflector’s weight without any issue. 2. How can I connect the ViparSpectra 600W LED Reflector to a 220-Volt circuit? The unit can be connected to a 220-Volt circuit. However, it comes with an electrical outlet for US connectors that supports 110 Volts only. Use a proper adapter if your electrical outlet is different. 3. Does this unit make unpleasant noise? No. The ViparSpectra 600W LED grow light has fans to cool the unit. They make noise, but not more than a fan set at mid power. Some people don’t even notice it. The VipareSpectra 600 LED grow light is an excellent choice that will help you save money. It is not only an affordable option but also an excellent substitute to 600-Watt lamps. You will save around 30% every month on electricity bills and get a great yield.